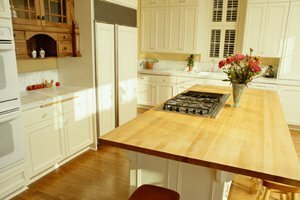 Where do you need Cabinet Contractors? Comment: Original cabinets were built on-site approximately 15 years ago. Want to expand kitchen with (1) additional upper cabinet over refrigerator (approx 20" ht x 22" overall width, exposed hinges), (1) open shelf for microwave (approx. 16" ht x 22" width x 16" depth, no facing; to be installed below existing refrigerator height cabinet), (1) 30" ht x approx. 22" width upper cabinet (door to either match existing or glass; exposed hinges), (1) base cabinet with 3 drawers to match existing drawer face, dividers (1 right, 1 center, 1 left) for dishwasher and ice maker. Will also replace countertop with L-shaped granite (3 cm, color Ooba Tooba with basic edge) approximately 10' (with cutout for double sink) and 14" on L-turn. (1) additional countertop approx. 3'. Comment: Replace 2 cabinets w/ glass. Install pull out drawer. New pull out trash can. Comment: New Kitchen Cabinets in our two bed room condo. Either painted white or Light wood tone. New sink and counter top. Phoenix East in Orange Beach, Alabama. Comment: Need existing cabinet altered to accommodate an ice maker. Orange Beach Cabinet Contractors are rated 4.82 out of 5 based on 261 reviews of 21 pros. Not Looking for Cabinets Contractors in Orange Beach, AL?